At Suffolk Libraries, we’re always keen to promote the digital aspect of the service, whether that’s digital library services, new technology or IT training. The iPad lending project combines all 3 as it improves people’s access to digital library services by providing them with the technology and the skills to do so. The project began with a request from a library that wanted to find a way to make tablets available to customers who did not own that kind of technology and were unable to get access online services. The first step was to trial a number of different tablets. Library staff and the local friends group road tested a range of different devices and agreed that the iPad Mini would be best suited to library customers because of its ease of use, durability and compatibility with our digital services. When researching this, Suffolk Libraries couldn’t find much on libraries offering this service in the UK and so we looked to the US where we found really helpful advice. The ambition was for customers to be able to take the iPad home with them so they could use the device independently, but we had to be mindful of potential risks. After initially considering charging a refundable deposit, we decided to create a user agreement where the customer must meet a set of criteria such as being over 16 and have been a library member for at least 6 months. They also sign to show they understand that charges will be made if they damage or lose the device. Additional ID verification is sought so staff can be sure of who they are lending the device to. This project also created a valuable partnership with a local electrical retailer. They had been supportive of a programme of digital skills development called ‘Get Connected’ events in the past. Now they supply the iPads as well as providing expert staff for launch events in libraries. Suffolk Libraries have been lending iPads from Halesworth library for just over a year now, and the next stage is to roll out the project to 14 more libraries across Suffolk. The libraries range in size and location, with some in market towns and others in small villages. All have requested to be part of the project because they have identified a need within their community for this kind of service. 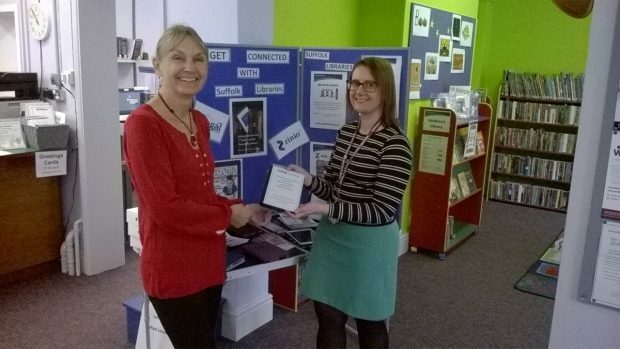 One library is using its iPads as part of a training programme for older people; customers attend a training session, borrow a device for 3 weeks and then return to a further training session to cement their learning. Another library is using them with young people to introduce them to eBooks in the library. Suffolk Libraries is always looking for ways to encourage customers to try downloading an eBook or an eMagazine, download music or listen to an e-audiobook. Despite some initial concerns, the project has been well received by both staff and customers in Suffolk. So far, we’ve fortunately not had any devices damaged, lost or stolen and haven't needed to revisit the user protocols. We did consider other approaches, such as asking for a deposit, but were unable to find anything that offered sufficient 'security' without compromising inclusivity. Offering a broad range of digital services and adding iPad lending allows all customers to access and enjoy these services. 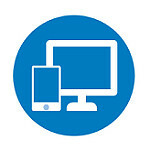 There is a growing confidence that it is increasing digital literacy as customers who had never used a tablet have been attending training sessions with staff, have started using apps and enjoyed the range of digital services they can access through the library. It is becoming increasingly obvious from waiting lists in libraries that there is a need for this service and more libraries are deciding to offer it as a result of its success.